Unfortunately for "Chiri" (as everyone on Vassal was referring to him) I didn't manage to finish any of his games. In the first game he went down to concentrated Cluster Missiles fire from 5 Z-95s, but we then realised that my opponent had been using focus tokens instead of Target Locks and he didn't have Deadeye on any of them! Still, it was an error on my part to get that close to my opponent's ships. This list works best in Range 2 or 3 and I need to get better at keeping my distance rather than closing in with my opponents early on. RACs second appearance was much more successful as a focused attack from him and his two wingmen stripped the shields and a number of hullpoints off of S&V Boba Fett after isolating him from his two wingmen. Unfortunately we ran out of time and weren't able to finish the battle but I felt pretty good about this game. It was at this point that I decided to run out a different list. RACs lack of maneuverability was starting to bug me for that many points and I decided to run out Vader with 3 Omega Squadron Pilots. The idea was to keep them all in a 2x2 formation, my lack of experience caused some issues here. Usually around turn 3 or 4 the formation fell apart and Vader was picked off. 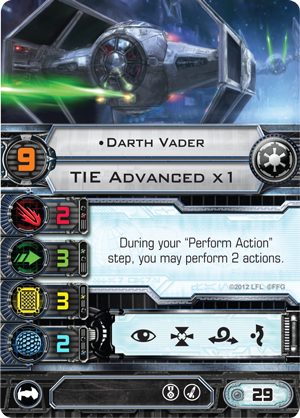 A little bit of research online seems to suggest that Darth should be running around on his own dodging arcs and hitting hard when he gets a shot, I even invested in an engine upgrade but never used the Boost action it granted! Massive fail there Jon! I think this list will require some more practice and knowledge before I can effectively use the list. Vader definitely has potential with the Advanced Targetting System, I just need to find the right support ships for him. I also want to find some Imperial ships with more of a punch, the Phantoms would be the obvious option, but as they are quite fragile I think it may be better for me to get the hang of some of the more standard ships first. Don't get me wrong, I want to give the Phantoms a run out at some point (Whisper and Echo are too good to leave on the bench indefinitely) but they need a skilled pilot and I am not quite there yet! By the end of my time on Vassal I wanted to give the Rebels a go but it turns out that Vassal doesn't have my favourite Rebel starfighter, the B-Wing! (anyone that player Rebel Assault II will understand) I guess I will just have to wait until I can play a game in person to break out the B-Wings!